: make sure that the connector is not damaged (the lock button is not disengaged, or the claw of the lock is not deformed or damaged). If the damage is found, replace the wire harness. 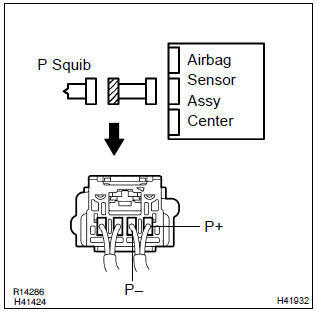 release the airbag activation prevention mechanism of the connector (on the airbag sensor assy center side) between the airbag sensor assy center and the instrument panel passenger airbag assy . 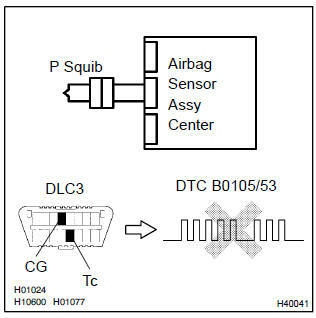 for the connector (on the instrument panel passenger airbag assy side) between the airbag sensor assy center and the instrument panel passenger airbag assy, measure the resistance between p+ and p–. 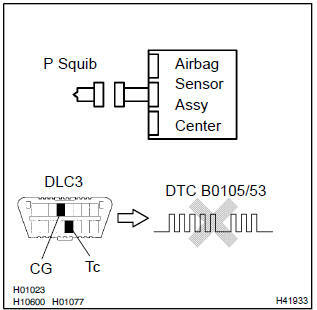 Ok: dtc b0105/53 is not output. : codes other than code b0105/53 may be output at this time, but they are not relevant to this check.